Who should use this integration? Watch a recorded webinar from our Video Library that walks through this integration. 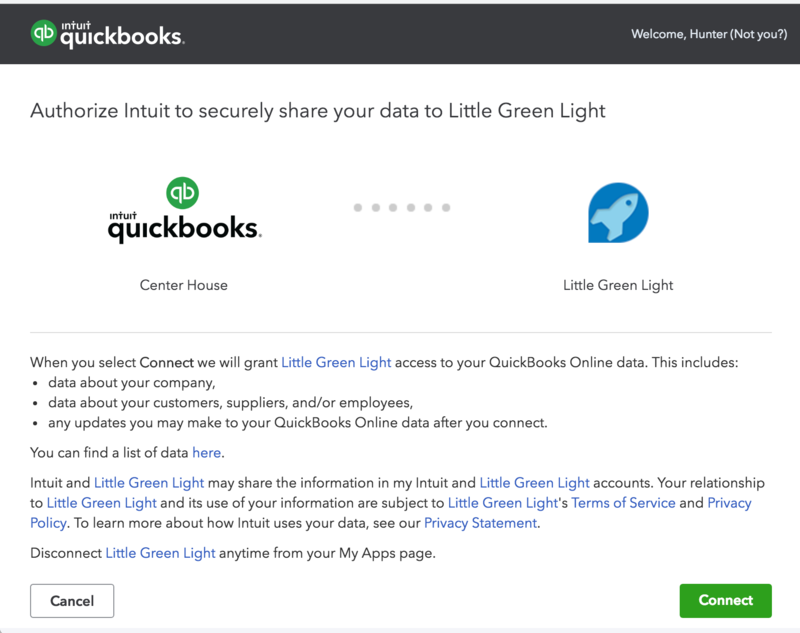 Little Green Light's integration with QuickBooks Online (QBO) helps you create sales receipts in QuickBooks (QB) without needing to re-enter any data. You can set default mappings to populate the Product/Service and Class fields in your QuickBooks account, and match or create QuickBooks Customers based on your LGL constituents. 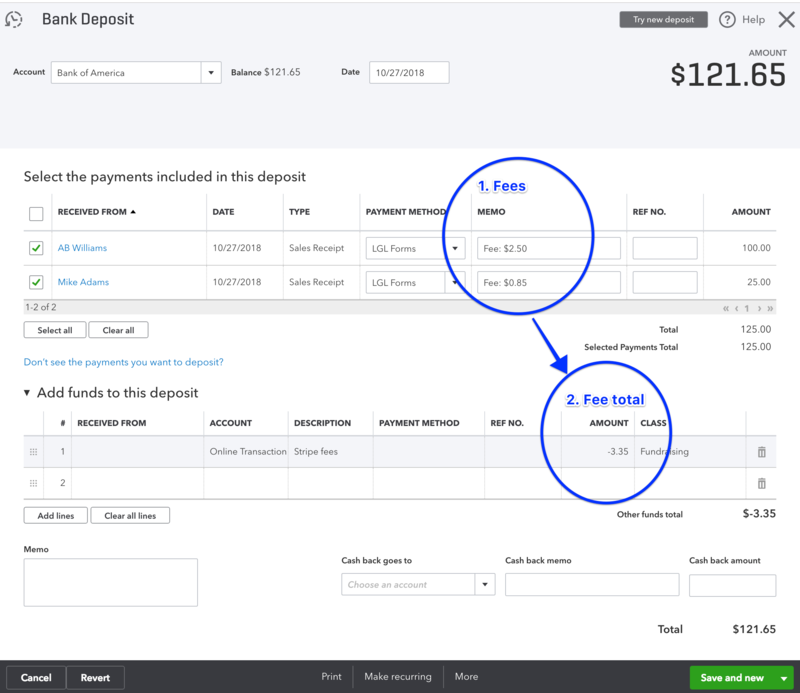 The synchronization is a two-way process that pulls back the deposit information for each transaction, once you’ve connected it to a deposit in your QuickBooks account. You must be an Administrator or Gift Entry user in your Little Green Light account to use this feature. If you are not an Admin or Gift Entry user, you will not be able to see any of these features when you use your LGL account. *REQUIRED: You must be using the QuickBooks Online Plus edition. The LGL integration requires you to set Classes for the gifts you're sync'ing over to QuickBooks. Only the Plus edition of QuickBooks Online includes Classes. The Simple Start and Essentials editions do not integrate with LGL. You can see a comparison here of available features for each of the QuickBooks editions. Which transactions can be processed through this integration? Please note that only "Gift" and "Other Income" entries are available to push from LGL to QuickBooks. This means you won't be sending over pledges or in-kind entries. Within your "gift" and "other income" transactions, you likely have different process flows depending on the payment type. For instance, the way you handle a check you receive in the mail likely follows a different process than money you receive via online donations. Using this integration may work really well for some types of transactions but not others, and it’s fine to use it for just a subset of your gift entries in LGL. Just make sure everyone from your team who is working on this is clear about which transactions should and should not be pushed over to QuickBooks from your LGL account. IMPORTANT: It is critical that both your development team and your accounting team agree on exactly which types of transactions will be handled using this integration and which won't be. For example, you might decide that only donations made via checks sent in the mail will be part of this integration. The QuickBooks integration feature needs to first be activated in Settings > Integration Settings. 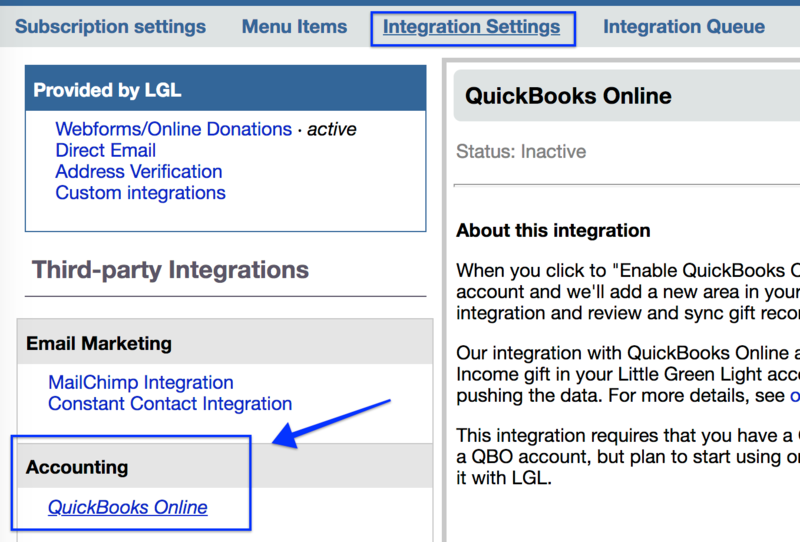 After activating the integration, you'll see a button to connect your LGL account with your QuickBooks Online account. 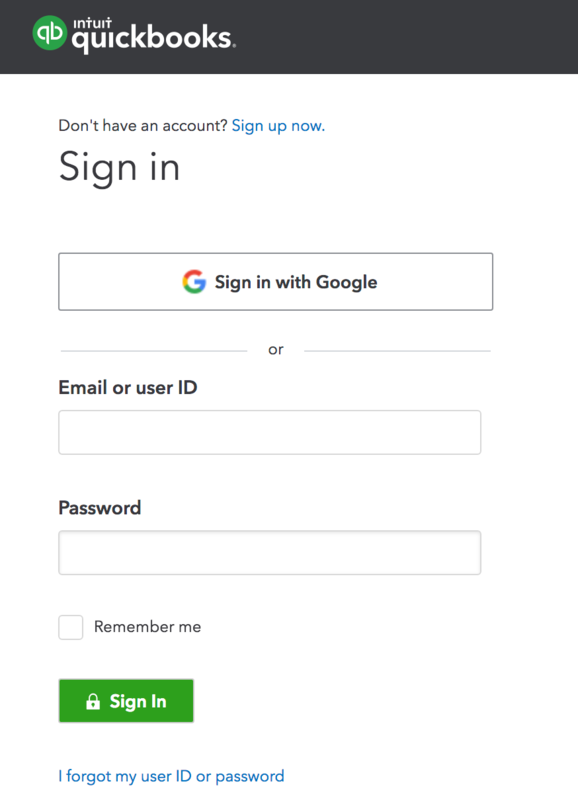 Once you're logged into QuickBooks, you'll see a request to link your QuickBooks Online account to your Little Green Light account. After you've connected your two accounts, the next step is to set up your default mappings so LGL knows how to categorize your transactions in terms of Products/Services, Classes, and Payment Methods. On the first tab you can select if you want a Customer in your QuickBooks account for each constituent for whom you're sync'ing a gift. The alternative is to use a generic customer ("General LGL Constituent"). For each of the other three areas, LGL will pull over your list of active values from your QuickBooks account. And, if you make updates in QuickBooks, you can click the Edit button (see screenshot above) and then click Refresh list (see screenshot below) to pull in the most recent list of values from your QuickBooks account. You can choose to use EITHER the campaigns OR the funds you use in your LGL account as the basis for setting the corresponding Class. You cannot use both. The reason for this is that conflicts could arise in which a single gift can have a campaign that is mapped to one Class but a fund that is mapped to a different one. It is possible to switch from using campaigns to using funds instead (as the basis for mapping your Classes). Making that switch will affect only future transactions; no previously recorded transaction will be affected. The diagram below gives a quick view of the steps you’ll be taking. We cover each in more detail below. When entering the gift record in Little Green Light, select the constituent, gift amount, gift category, campaign/fund, and payment type, as you normally would. 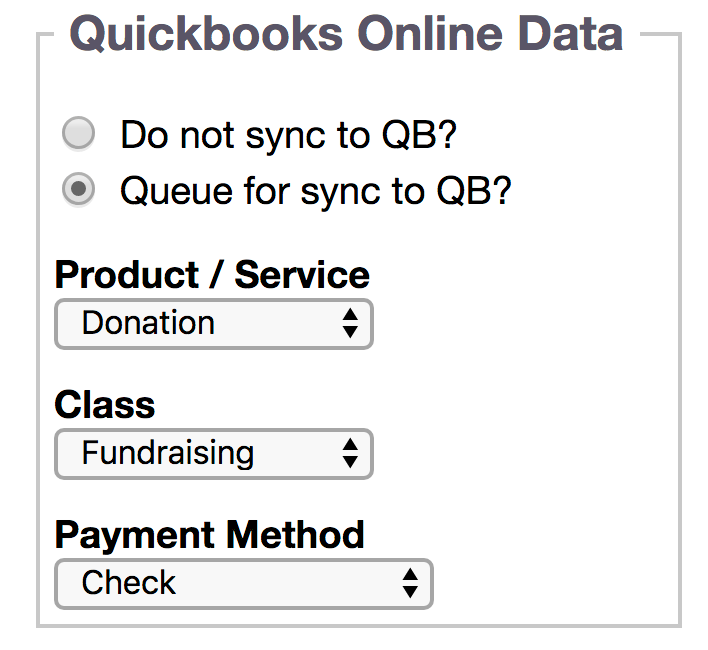 Then select "Sync to QuickBooks" and confirm that the appropriate Product/Service, Class, and Payment Type are set. You can manually edit (override the default values) for Product/Service, Class, and Payment Method. Your transaction is now queued to sync to QuickBooks. Once you have one or more gifts queued for QuickBooks sync’ing, look in the Queued gifts queue and check that all the information looks correct. All of the QuickBooks fields must be populated before you can sync the gift record over to QuickBooks. LGL will highlight fields that still need to be set. Every transaction needs to have a Customer in QuickBooks. If your settings are set to create or match to a distinct Customer each time, then if no Customer is matched yet, you'll see a red warning in the QB Customer column. Click the Set Customer button within the warning to link your LGL constituent to a Customer in QuickBooks. You can either match or create the Customer in QuickBooks. Note that Little Green Light can find matching Customers using name and email address. 1. If you like the proposed match, click the blue Link button to connect the two. To search some more for a match, you can click one of the other search options, such as by email or organization name. 2. Or, you can click the "Create Customer in QBO" button to create a new Customer record in your QBO account based on the LGL constituent's name and contact information. When no match is found, you can 1) choose another search option (i.e., search by email address or organization name), or 2) click the "Create Customer in QBO" button to create a new Customer record in your QBO account based on the LGL constituent's name and contact information. Once you push over gifts, they create Sales Receipts in your QuickBooks account, with the funds going to the Asset named Undeposited Funds. You'll then need to move those funds from Undeposited Funds to the bank account where the money is being deposited by creating a Deposit (in QuickBooks). You'll see the transactions that came over from LGL as available Sales Receipts when you start to create your Deposit. Check the box on the far left of each row that you want to include in your deposit. A very important step here is to enter any fees associated with those transactions. For cash and checks, there won't be any fees, but for online transactions you should subtract the fees charged by the online payment processor (because those fees are subtracted from the amounts the processor will disburse to your bank account). For transactions coming through LGL Forms, LGL uses the fees for each transaction to record a Deposited Amount (this can be made visible in your LGL account on request). We then calculate the fees and pass that over to QuickBooks on the Memo line for each transaction. See the highlighted section in the screenshot below. You'll want to choose an account for the online fees and then enter the amount as a *negative* amount. You'll see the net total for the deposit listed at the bottom of the screen (in this example, it's $121.65). Back in Little Green Light, the Processed gifts tab shows every gift that’s been sync’d over to QuickBooks. The column on the far right shows the sync date and status. When a gift is first pushed over to QuickBooks, it creates a Sales Receipt. Later, after you pull that Sales Receipt into a deposit in QuickBooks, that status will get reflected back in your LGL account automatically within 24 hours. Or you can use the Pull deposits from QBO button to get a live sync of that information. 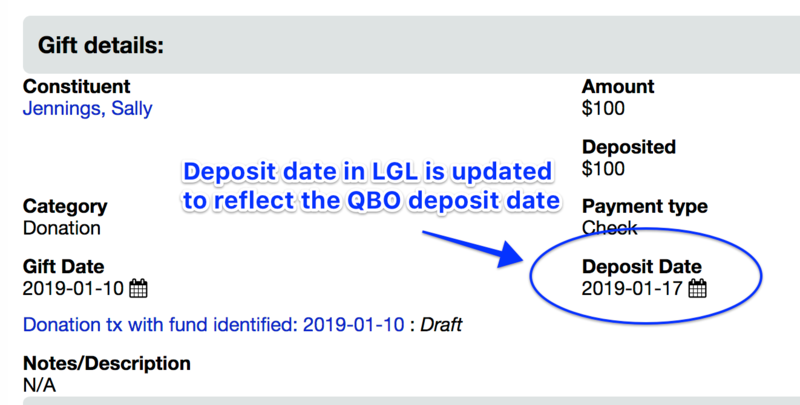 Once you deposit a sales receipt and the deposit info has been pulled back to LGL, the deposit date for that gift in your LGL account will also be automatically updated. The development director places the physical checks in an envelope on the bookkeeper's desk labeled "to be deposited"
Little Green Light customers don't always use LGL Forms for payment processing, but for this example we will be using LGL forms as the example, with Stripe as the payment processor. Note that Stripe assesses its transaction fee at the time of each transaction. A likely approach would be to wait until a transfer occurs from your Stripe account to your bank, and then use the transfer report that Stripe provides to record the transactions in your QB account, noting the net amount transferred by Stripe (after transaction fees are deducted). When using the LGL-QB integration, you can push transactions from LGL to QB anytime after they're recorded in LGL. As with all such transactions, they go into QB via the Sales Receipt and the revenue is booked to Undeposited Funds. Now, rather than having to enter the transactions from the Stripe transfer report, you can simply select the appropriate Sales Receipts for your deposit. LGL includes the Stripe fee information in the gift memo field. You can use this to calculate the fees to add into your deposit. Q. Will LGL also integrate with the installed desktop version of QuickBooks? A. No, we do not currently have any plans to build that integration. Q. Can I use something other than Gift Category to drive the Product/Service selection for QuickBooks? A. Gift Category is the only LGL field you can use for mapping to the QB Products/Services field. However, you could manually set the QB Products/Services selection on each gift (meaning LGL will not pre-select a value for you). Q. Can I edit a gift entry in Little Green Light after I've sync'd it to QB? Q. Can we push in-kind gifts from LGL to QB? A. No. We have purposely not integrated in-kind gifts from LGL to QB, because in LGL it's common to enter a dollar value for your in-kind gifts, but you wouldn't want that pushed to your QuickBooks account since it's not going to result in money in the bank. Q. Can we push pledges from LGL to QB? A. No. We have purposely not integrated pledges due to the complexity of tracking pledge payments to the proper Invoice in QuickBooks. We know this won't work for all organizations, but we believe it makes most sense to track your pledges in your Little Green Light account and sync only your actual pledge payments to QB.